Liberty Township administrative offices are located at 39 Topper Road, Fairfield, PA 17320; phone: 717-642-3780. 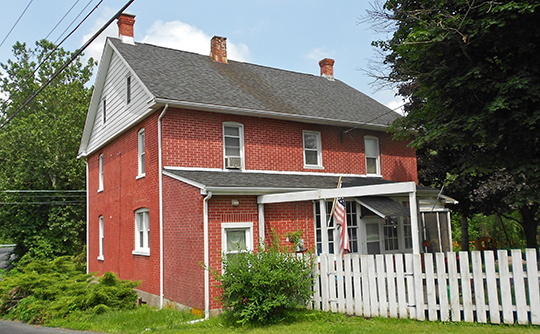 Photo: House in Zora, Liberty Township, Adams County, Pennsylvania. Photographed by User:Smallbones (own work), 2015, [cc-by-1.0 (creativecommons.org/publicdomain/zero/1.0/deed.en)], via Wikimedia Commons, accessed February, 2018. Liberty Township, which in earlier years was a portion of Hamiltonban Township along with Highland and Freedom Township, was settled by people of German and Scotch-Irish descent around the year 1736. Struggles involving boundary disputes, Indian relations, ethnic groups, and national issues clouded the early history of these settlers. However, these immigrants endured the hardships and began clearing the dense forest land for farming. Subsistence farming dominated at first, but by 1840 and the advent of more efficient transportation, commercial grain and livestock farming increased in consequence. The Scotch-Irish were the most populous of the early settlement of Fairfield. This village was previously known as Millertown and the surrounding lands were known as Carroll's tracts. These tracts were large parcels surveyed and held by the Carroll family under Lord Baltimore's title before the County's southern boundary had been firmly established. At the time of the French and Indian War (1754-1763) the area of Hamiltonban Township was the scene of many Indian raids, although the natural barrier of South Mountain and the block houses to the north and west served to provide some degree of protection. Subsequent to the formation of Adams County from York County in 1800, Liberty Township was created from Hamiltonban Township at the turn of the century. Serving Adam County in the House of Representatives,Thaddeus Stevens was one of the most adamant and vociferous advocates of free public education. He was largely responsible for the Act of 1834 which established free schools and also for the defeat of an 1835 bill which would have repealed his efforts of the preceding year. Liberty Township was among the opposition to the creation of a free school system along with eight other Adams County townships, despite Stevens' critical role in the legislation. Indian culture was a dominant influence in the area now recognized as Liberty Township prior to the advent of the white man. There is a stone found near the Maryland line known as "hominy stone" which Indians used to travel great distances to obtain in order to pound their hominy. Many arrowheads were discovered in the Township for a number of years indicating that the area was a popular Native American campground at one time. The earliest permanent settlements in the municipality seem to have been established around 1736. These original Township settlements were known as Cochran's Tract to the east, Porter's Tract to the west, and McKesson's tract to the north. Upon the creation of Adam County, the first County convention was held in Gettysburg on September 23, 1800. James Thompson and David Agnew attended as delegates for Liberty Township. According to figures from 1810, the Township population was 1,079, roughly two hundred more persons than would be counted in Liberty Township in the 1980 U.S. Census. Those 1,079 citizens included 535 males, 491 females, and 49 free colored. Perhaps the most famous resident of Liberty Township was also its first settler. Captain John Hanson Steelman (1655-1749) is said to have been the first white settler in Pennsylvania, west of the Susquehanna River. Of Swedish ancestry, Steelman was born in Philadelphia and kept company with such famous historical figures as William Penn. He came to Adams County as an Indian trader and interpreter and through his proficiency in Indian culture, gained the trust of the local tribes and may have played a part in resolving the Pennsylvania‑Maryland boundary dispute in this area. Although much of the information available regarding John Hanson Steelman is not well documented, a historical marker was placed in his honor at the intersection of Crum Road and Topper Road on November 29, 1924, near the village of Zora. The most traumatic event in Adams County's modern history is undoubtedly the Battle of Gettysburg during the Civil War in 1863. A bloody battle between Union and Confederate forces occurred just a few miles from Fairfield and retreating Confederates from Gettysburg surely passed through the bounds of Liberty Township on their way south. The latest major event of significance within the municipality involves the formation of Carroll Valley Borough and the split of Liberty Township into two separate, noncontiguous tracts. The development of Charnita, a subdivision with over 5,000 home sites and varied recreational facilities, in the 1960's prompted such a high degree of residential growth that a moratorium was placed upon the subdivision until centralized sewage facilities were constructed. This prompted Charnita to develop its own municipality, the Borough of Carroll Valley which comprises former portions of Liberty and Hamiltonban Townships, in September of 1975. A portion of Charnita still exists in the northeast quadrant of Liberty Township. Today, the Township is experiencing little land development pressure, but increasing influences from Frederick and Carroll Counties in Maryland continue to indicate possible mass emigration to southwestern Adams County. Martin and Martin Planning Consultants for Liberty Township, Liberty Township, Adams County, Comprehensive Plan Phase I, 1991.